In desperate need of extra seating? Don’t just sit there! 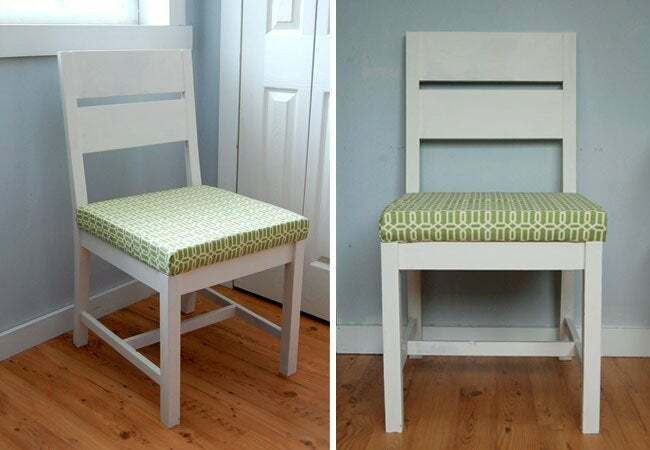 Save money—and add personality to your space—by building one of these crafty DIY chairs. Whether you’re preparing to entertain a crowd or just looking to fill a sparse corner of your living room, a spare chair is just the ticket. But when you see that a store-bought seat rings up at a few hundred dollars, you may find that investing only a fraction of that cost—and a weekend of your time—sounds much more appealing. Building your own furniture is a simple, affordable, and rewarding project for any DIY enthusiast. 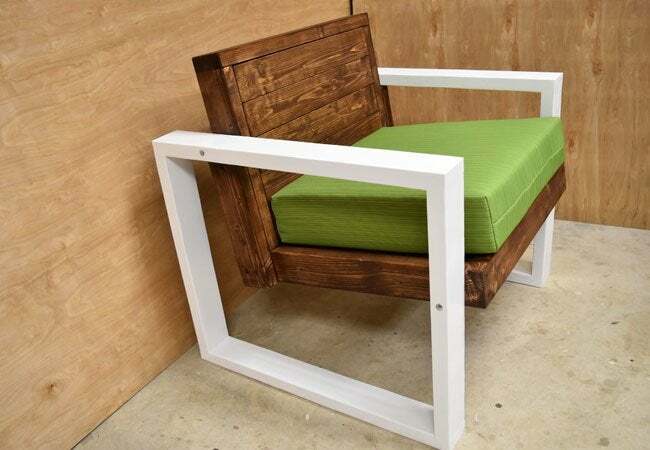 With a few tools and some common materials (discarded pallets and standard two-by lumber from the local hardware store), you can construct anything from a set of patio chairs to a formal dining chair. Still skeptical? We’ve rounded up seven inspiring DIY chair options, which can be modified to fit your home’s needs, style, and available square footage. Turning a set of chair plans into a striking seat took Instructables user diycreators little more than a bit of improvisation and a few of the usual suspects when it comes to building materials: 2×4 lumber, a router, a circular saw, a power drill, screws, a bit of wood glue, and the necessary products for protecting the final product against weather damage. The seat is supported by bolts in four places along the square-frame legs, so you can count on this modern two-toned chair to be sturdy. This “made-from scratch” wingback chair required serious concentration and craftsmanship, a challenge that the DIYer behind Addicted to Decorating gladly accepted. And did she come through! To aid in finding the proper angles for the back legs and a perfect seat height, she traced one of her dining chairs onto some 2×6 lumber, and then cut. And, believe it or not, she drew the shape of the ever-classic wingback frame freehand and, as she did with much of the rest of the project, cut it out with a jigsaw. Contrasting upholstery patterns in bright colors offer an updated take on a traditional silhouette. 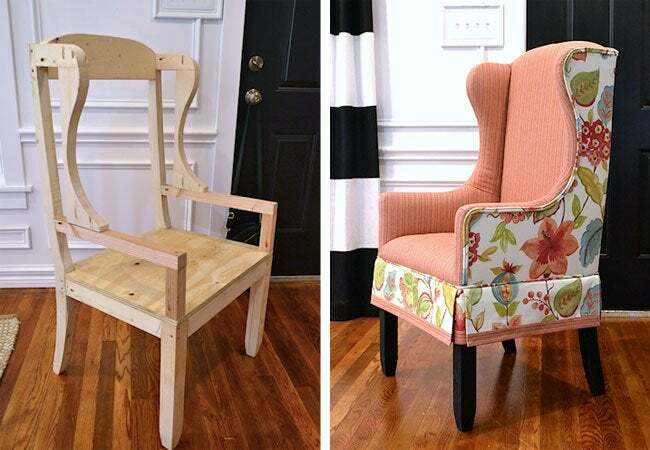 While it may seem too good to be true, Ana White built this DIY chair in just one hour, proving that furniture feats can happen and still leave you with plenty of time to accomplish the rest of your weekend to-do list. Her detailed cut list and set of diagrams can help you re-create this sturdy seat for around $20—all in less time than it takes to mow the lawn or cook a family dinner! These modernly rustic stick chairs have a secret superpower: they fold. Inspired by an interior design post on Instagram, the minds behind Southern Revivals constructed the seats with some power tools and pine (although cedar is also an option), using eight slats in the back, eight slats in the seat, and another handful for the legs. 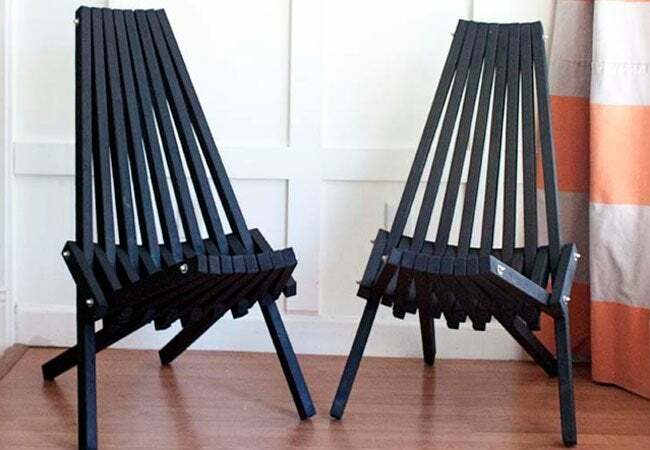 For a finish as dramatic as the design, each DIY chair was coated with black milk paint and sealed with tung oil. This two-seat pallet chair from Funky Junk Interiors is a rough-and-tumble take on a traditional country love seat. 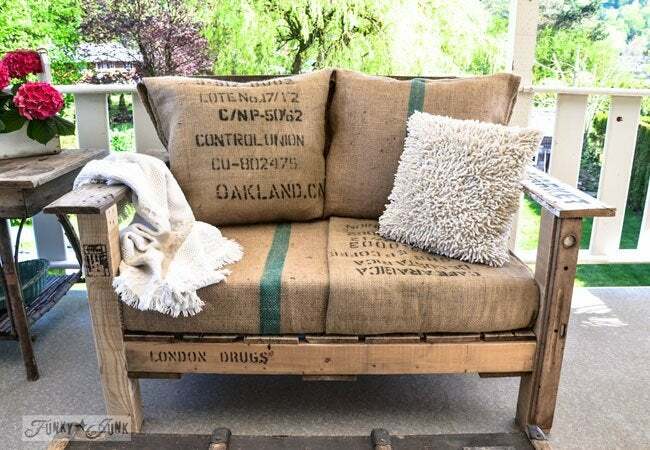 Requiring only a shipping pallet, some reclaimed wood, foam, and burlap sacks, this project can be customized by printing a favorite logo or phrase on the back cushion. Or, simply embrace the weathering, printing, and stamping of your found wood and burlap to make your DIY chair the shabbiest of chic. 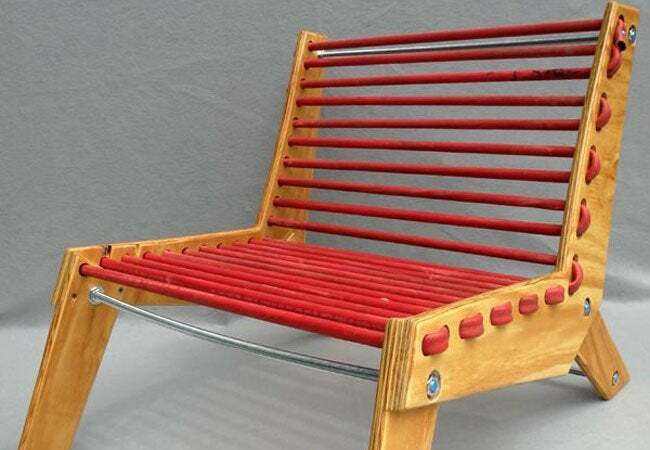 In this fun and funky design, Instructables user wholman repurposed a length of rubber air hose of a type often found at construction sites as the support system for a DIY chair. Because it incorporates 45 feet of such a heavy-duty material, this chair is built to support—and it molds perfectly to the person sitting on it. In total, this whimsical project took around $20 and left behind little waste. 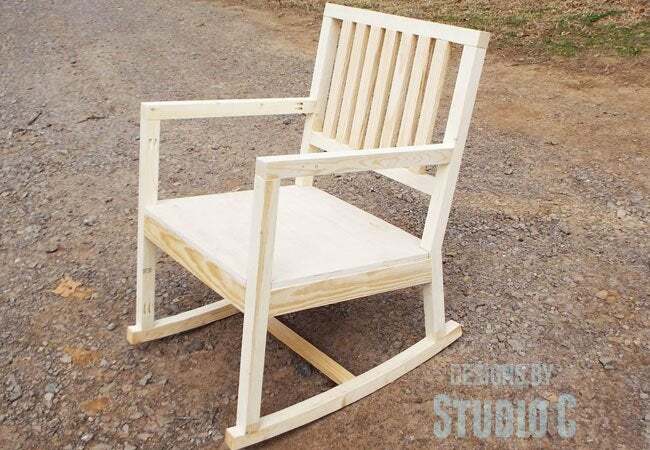 As it requires a certain amount of precision for maximum results, this rocking chair project puts a builder’s measuring skills to the test. Cher at Design by Studio C worked with scrap boards and lumber, relying on an extensive cut list, pocket-hole screws, and wood glue to bring her vision to life. The result: A classic homemade rocking chair that, if treated with care, can be handed down for generations to come.